 GameTracker.com - Quake 3 Banners, Forums, Status Monitors, Server Statistics and more! GameTracker.com has added support for Quake Live stats to our network! Quake Live is a first-person shooter with over 12 game types and over 100 arenas to compete against other players. Today only, save 50% on Fallout: New Vegas and all DLC's and save 66% on Fallout 3 and its DLC's! Owners of New Vegas will also receive the "Pip Boy" for the Engineer in Team Fortress 2! Today is also the last chance to pick up Brink, Quake 4, or pre-purchases of Skyrim and Rage, and gain in-game TF2 items (see store pages for details). Finally, the massive QUAKECON Pack, a collection of all released id and Bethesda titles is available until tomorrow morning at over 75% off! Now through Sunday at 1PM PDT, play BRINK for Free! You can also check out the newly released DLC, "Agents of Change, which includes New Maps, New Abilities and New Character Outfits! Additionally, save 50% on BRINK until Monday at 10AM PDT! All owners of BRINK also receive "The Anger" Hoodmask for the Sniper in Team Fortress 2. Finally, the massive QUAKECON Pack, a collection of all released id and Bethesda titles is available until August 8th at over 75% off! In celebration of the mega gaming event QUAKECON, save big on different games from id Software and Bethesda each day, now through August 8th 10am PDT. Today only, save 65% on all DOOM & QUAKE titles when you buy the DOOM & QUAKE Complete Pack, which now includes the newly available Quake 4! If you just want a few of these classics to fill out your collection, they are also available for 50% off individually (except Quake 4). This offer ends on Friday at 10am PDT. Rage (PC)This year's gathering of LAN partiers. As QuakeCon 2010 rolls into its last day, Steam presents the final edition of the QuakeCon Steam Sale. Today, save 75% off QUAKE titles! Since the QUAKE titles are not available in Germany, German customers can pick up The Elder Scrolls III: Morrowind&reg; Game of the Year Edition for 75% off today only. This is also your last chance to pick up the QuakeCon 2010 Pack and save mpre than 70% off a huge bundle of games from id Software and Bethesda Softworks. Quake 3 Game Servers from $0.79/Private Slot!